Happy 2019! Welcome to a brand-new year of The Con Guy and our Comic-Con Prep Show, produced exclusively by the Popcorntalk Network. 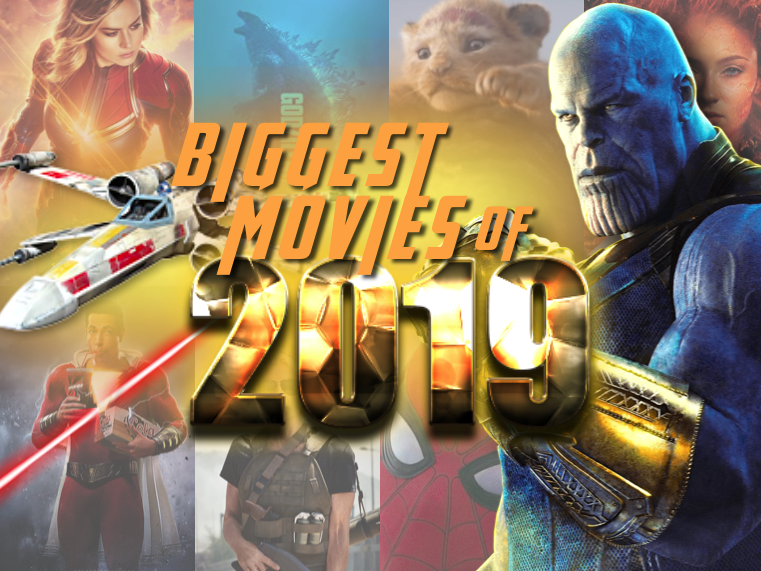 On our first show of 2019, we preview all the movies we’re most excited about in 2019–which is A LOT! Happy New Year! Please watch the show right here, or download anywhere you listen to podcasts. THEN, check out our list after the show (or follow along) and let us know what you think. Lots of winners and stinkers on the list. Here’s our list of the films that we can’t wait to see. But let’s be honest–there’s gonna be a bunch of stinkers here too. So, we also included a few snarky suggestions of which ones we think will bomb. We could be wrong, but our gut reactions are usually pretty spot-on. Let us know your thoughts. M. Night Shyamalan has finally steadied his career after the crappy ‘The Happening’ and ‘The Last Airbender.’ I was one of the few, though, who really loved ‘Lady in the Water,’ which I guess makes my opinion dubious in the eyes of many. Oh well, you know what they say about opinions–just like a-holes, we all have them. If ‘Wayward Pines’ was the lifeline that saved his career, then ‘Split’ is the film where he finally found his swagger. Now comes Glass, a direct sequel to both ‘Split’ and his earlier ‘Unbreakable.’ This may not do giant box-office business, but I, for one, can’t wait to see it. Chris Pratt. Funny animation. Phil Lord and Chris Miller. It’s a recipe for huuuuge success. Feb 14 – Alita: Battle Angel – Bomb. Not completely sure this movie is tracking well with audiences yet. But James Cameron can almost do no wrong, so he may surprise us on this one. Advance tickets are already burning up the charts on this one. Although I’m not sure this will be quite the phenomenon that Black Panther was, crowds are sure to turn out to see how Captain Marvel jumps in to save the universe from Thanos. In other words, this movie is sure to benefit from the “Avengers” affect. This is the first of four (FOUR!!!!) Disney live-action re-makes this year (the Lady and the Tramp remake is happening on Disney’s new streaming service this fall). I’m not sure how much of this re-hash audiences will accept. Zachary Levi is a beloved treasure of Nerd Nation, and those nerds (us!) will turn out in droves to see this. Good on Warners for getting some humor in their otherwise dark, dark super-hero world. Biggest film of the year. Hands down. Not my thing, but apparently other folks are really stoked about this one. Not a huge hit, but a cheesy action film in May is always fun. Kinda fuzzy on this one, but Brad Pitt’s films usually don’t bomb. Of all the Disney re-makes hitting theaters, this one has the greatest likelihood of bombing. Will Smith hasn’t really been a box-office draw for years, and everyone else in the cast is a no-name. PLUS, I’m pretty sure the online outrage mob will find some reason to hate on this film. Our current PC culture makes films like this an increasingly risky proposition. GIANT MONSTERS! Kaijū! King Gidorah!!! Sure, the film might be overly dramatic and just plain dumb–but opening weekend will feel the earth shake as Godzilla stomps all over the competition. Count me as worried. The Dark Phoenix is one of my favorite storylines ever. Same for TONS of comics readers. X-Men 3: Last Stand’s Dark Phoenix storyline was disappointing on a galactic level. Let’s hope the folks at Fox have course-corrected for this film, especially considering it’s one of their final X-Men outings before begin gobbled up by Disney/Marvel. The duo of Thor/Valkyrie, as played by Chris Hemsworth/Tessa Thompson, doesn’t have the same draw as Will Smith and Tommy Lee Jones. Smith’s star may be on the wane, but this new outing looks–humorless. Nick Fury and Lucky Logan are both in the trailer, which bodes well for Spidey’s next solo adventure. Seriously–this film looks awesome! Disney’s third or forth billion-dollar film of the year. The horror version of the X-Men. And Fox’s final X-Men film. Ever. Hope it goes out with a bang. The first film became the most successful horror film in history. Chapter Two will probably continue that winning streak. I love Todd Phillip’s films (Hangover 3 notwithstanding). But this one smells funny. It will either be a surprise hit or a not-so-surpising flop. With James Cameron involved, though, it will at least be good! Another billion for the mouse. Another ear worm to haunt your sleep. The Rock and Kevin Hart were a potent mix for the first one, which became a major blockbuster even though it competed against Star Wars: The Last Jedi. Well, the star duo is back, and they’re again up against a Star Wars film. Maybe lighting can strike twice. After the polarizing The Last Jedi, word on the street is that J.J. Abrams is pulling out all the stops to bring all Star Wars fans–from every generation–back together for this final film in the nine-film Skywalker saga. George Lucas originally envisioned nine films, so seeing the culmination of his grand magnum opus cheers my heart! All hall Star Wars! Here’s hoping it lives up to the promise that Lucas began all those years ago.